Ta Chi Nhu, also known as either Phu Song Sung by the local Thai ethnic minority, or Chung Chua Nha by the H’Mong hill tribe, is situated in the Pu Luong Massif, part of Hoang Lien Son range. Currently Ta Chi Nhu is the sixth highest mountain in Vietnam, which is often compared to “an ocean of clouds”, attracting many photographers and trekking enthusiasts. There is almost only one trail leading to the peak, which is winding, foggy with many high cliffs. The higher you get, the stronger the wind. Trekkers must be careful and follow each other as well as follow the instruction of the leader. The route is precipitous with nearly no stopover, quite discouraging, so you need to be at really good health. Don’t forget to bring along the necessary travel gears such as tent, water and food. 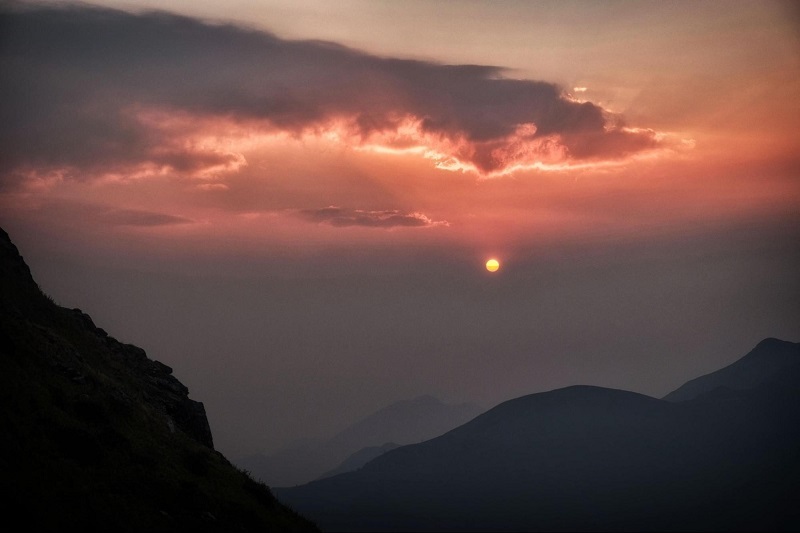 However, if you conquer the 2000 meters and take a night camp, you will have a unique chance to watch the mesmerizing dawn and sunset over the fuzzy clouds. Forget all the tiredness and challenge yourselves, pass over the old-growth forest, reach the bamboo forest and you will not regret your effort. At that moment, you will admire the unforgettable picturesque landscape of green leaves, yellow wooden trees topped with the dimming clouds and blurred in the mist. It is often hazing at the foothill, but standing on the top in the morning, you can see the magnificent ray of lights stroking through the white clouds. Enjoy the night camp with the fire flickered in the dark, and have a cloudy dream. 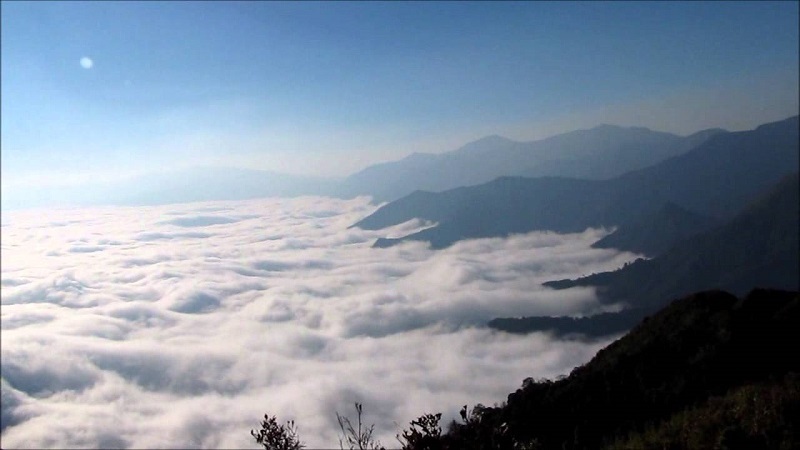 Nevertheless, you can only witness the ocean of clouds when you are right on top of Mount Ta Chi Nhu. From the 2000 meters altitude up to the peak, you can enjoy the wonderful bird-eye view of those grassy hill sides with colorful flowers and green leaves, just like a meadow in heaven. As you get higher, the clouds are all the more beautiful, like a white scarf covering up the hills. You can see some animal farms somewhere up or down, with cattle wandering around grazing grass. From the peak, you can easily see the further Ta Y Cho peak, Ta Xua peak to the left, and Phu Sung Song faded behind. In the ocean of clouds, those peaks are floated just like some stunning islands. You may never feel the cloud and the sky coming at that close, just like everything is within your hands. And you will realize, it is the miracle of nature that creates such an exquisite masterpiece. 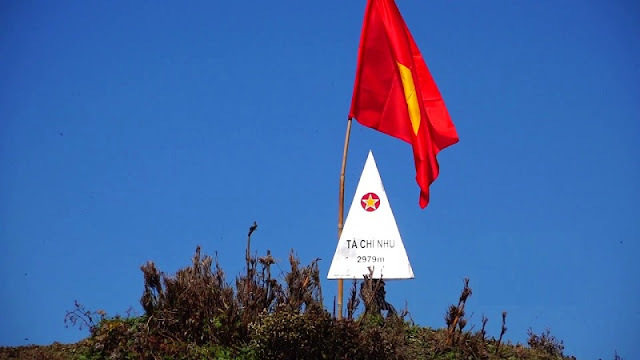 Trekking enthusiasts, have you fell for Ta Chi Nhu? Just opt for our stunning Vietnam tours right now, and plan to a day and a half trekking tour to enjoy the infinite freedom “at the top of the world” and conquering yourselves.